Apple's spending on research and development has skyrocketed over the past few years, according to information gleaned from the company's annual Form 10-K filing with the SEC. The Verge reports that Apple spent a total of $4.475 billion in its 2013 financial year, an increase of 32% from the previous year, and a massive 87% increase from 2011's $2.4 billion. "Of course, due to rising profits, the ballooning R&D costs actually represent a very similar percentage of the company's income being invested over the past two or three years. Back in the days of iPhone development, however, Apple was proportionally investing double what it is now." In comparison, Microsoft spent $10.4 billion last year and Samsung announced that it plans to spend $3.5 billion just on R&D buildings. 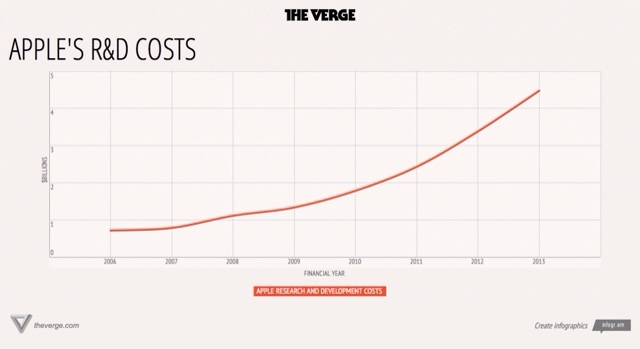 Check out the chart below to see Apple's increased spending since 2006.